They have come together, to live at Arcadia House. For some, it’s the opportunity of a lifetime, for others, it’s a last chance. In order to survive the year, the six strangers must find a path through new challenges and adventures. A long way from home, the last thing they expect to find is family. Zoe has hopes of fulfilling her long-held Olympic dreams, while Levi is a rising talent in the football world. Away from parental pressures, Dylan pursues his passion for electronic music and graffiti art, and Ava must overcome her fear of performing in public. After her mother passed away, Lily got caught up in the wrong crowd. Her father moves her to Arcadia House, in the hope that new friendships and passions will allow her to finally overcome her grief. Reece has a secret - an invitation to come and stay at Arcadia House is the solution he desperately needs. Ready for This tells the story of what it’s like to be thrown together in a big city to pursue your dreams, while dealing with all the trials of growing up. Five elite teens from around Australia find placement in Arcadia House, a hostel in Sydney. Ava must cope with a new, cool music school, a haunted bedroom and her desire to make friends, despite her crippling shyness. Levi and Zoe meet and form an instant attraction, but an old family feud keeps them apart. 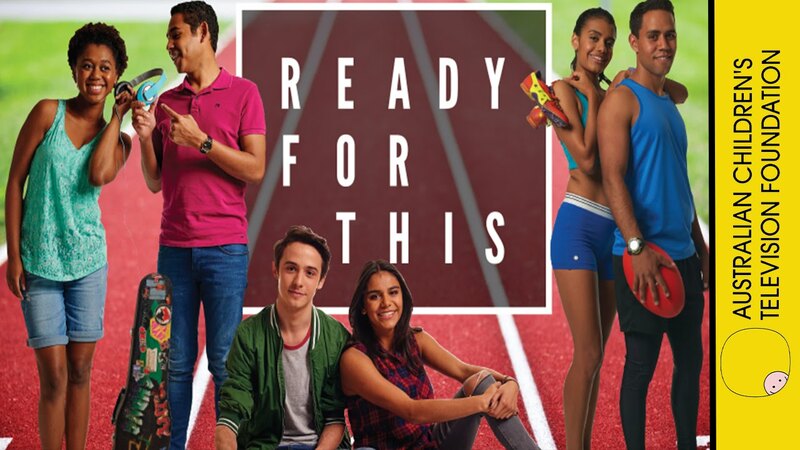 Zoe struggles to find a connection with the other girls in her elite athletics squad, and must also face the fact that down here in Sydney, she is not the fastest runner. Meanwhile, Lily, a tough girl from Kempsey, spends the whole of her first week scheming to find a way back home. When she receives an offer from a stranger to drive her home, the news worries the others. And rich boy, Dylan, defies his parents, who think he’s come to Sydney to study classical violin, when he secretly changes his course to electronic music production. Meanwhile, Dylan receives a visit from his high-profile Dad, who organises what he thinks will be a treat; Lily challenges Zoe to a boxing match to settle things between them; and Ava and Zoe discover the truth about Lily’s mum. Out one night doing his stencil work, Dylan is confronted by the local graffiti crew. He gets away, but the next day realises that one of the crew is Ryan, a student at SIM. He finds the courage to come clean to Ryan and before he knows it, is finally part of a ‘graff’ crew. Zoe is forced by her father to admit that she was feeling ashamed by the arrival of her large and enthusiastic family, and he tells her that she should never forget where she came from – and never stop being proud of that. Faced with a choice between family obligation and teen romance, will Zoe choose her family and break up with Levi? Ava meets cool roller-derby-chick, Macy, who encourages her, Zoe and Lily to get wheels under their feet and join her roller derby ‘fresh meat’ trials. Dylan gets into deeper waters with Ryan and the lads, and his allegiance to the crew is finally tested when he says no to their request to steal some spray cans. Meanwhile, Levi’s charm offensive to woo back Zoe implodes, when he makes a brave confession of his affection. Levi’s Dad, Jimmy, is released from jail and Levi is forced to face a lot of unresolved questions about their relationship. When Jimmy fails to show up to an important football game, it is Zoe who secretly brings father and son together. Meanwhile, as Dylan, Levi, Ava and Zoe find a new connection through the competition, Reece and Lily return to the house with the winning item in the scavenger hunt at the last minute. Because of this, Lily finally starts to accept that maybe Arcadia House is the right place for her after all. Lily overcompensates when she organises a 16th birthday party for Reece. He’s never had a party before and Lily pulls out all stops, but when Mick is called away to a family emergency, the inevitable happens: gatecrashers swamp the house. Just as the party is in full swing, Lily takes herself away and realises that the whole thing has been a tactic to avoid facing the anniversary of her mother’s death. A chance encounter with some rowdy gatecrashers will have dire effects in the weeks to come. Meanwhile, Ava and Macy kiss for the first time; and Zoe’s jealousy over Levi and Alice being together results in her tipping an entire bowl of punch on Alice’s head. Lily discovers a photo of her has become a meme and suddenly her face is all over the internet. She tries to shake it off, but in the end confesses to Vee that all she wants is her mother. Out of anger at Alice and Levi, Zoe risks everything by participating in the roller derby. Injured in a jam, she is dropped from her coveted spot on the relay team. Not only that, Alice forces Zoe to ask Levi about his true feelings. His hesitation sees him lose Alice and Zoe. In the face of strong competition, Levi loses his confidence and the grand final, but Jimmy is there to put things in perspective. It’s the lead up to Ava’s final showcase, and her stage fright is causing her serious issues. Macy tries to help, but it’s Vee who has the best solution – Koorioke. When Ava takes Vee’s advice and sings only to Macy – she finally has the courage to be a star. Plus, an unexpected arrival makes the night complete. Meanwhile, Zoe’s best friend, Kodie, arrives from Darwin for time trials, but instead of a happy reunion, simmering resentments overflow and Zoe finds herself unexpectedly in competition with Kodie and Alice. Determined not to let Alice beat her again, Zoe underestimates Kodie and finds herself knocked out of contention for the summer training camp in Colorado. The only consolation is a late breaking admission of her feelings for Levi - which he gladly reciprocates. As the year closes, each housemate attempts to cling onto the dream they began with. Zoe must swallow her pride, make up for Colorado by winning the relay for Kellett St. Levi has to stop trying to please everyone, including Zoe, and finally make a choice about where he’s going to spend the summer. Lily faces her fear when she confronts the ‘meme’ boys at debating, and Reece questions his place in the house. And Dylan races off to get Ava back to SIM in time to do her showcase, but she’s not allowed to sing. She encourages Dylan to go onstage where he performs a spoken word piece that blows his teachers away. In spite of everything – Dylan is starting to find his voice.